A Space Director and therapist Lyn French reflects on how conscious and unconscious drives, motivations and early life experiences play a role in our relationships with self and others. 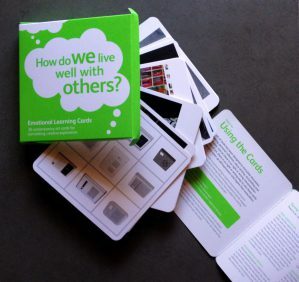 Iniva and therapeutic support service A Space are delighted to announce the publication of our latest educational resource entitled ‘How do we live well with others?’ part of our Emotional Learning Card series. The cards feature artworks as well as accompanying discussion and commentary for use by therapists, educators and parents to support social and emotional development. ‘How do we live well with others?’ addresses questions such as What has influenced who we are now and how do we make sense of who we are becoming? What are the conscious and unconscious impacts of history, memory, class, race, culture, gender, family and society on our perceptions of ‘self’ and ‘other’? Each card features artworks which have been selected for their psychological resonance and their visual impact. We generously thank the artists for their support of the emotional learning project. Featured artists include: Yinka Shonibare MBE, Ai Weiwei, Shirin Neshat, Tania Bruguera, Francis Alÿs, Lu Chunsheng, Doris Salcedo and Oscar Muñoz amongst others. Emotional Learning Cards – How do we live well with others? How do we live well with others? is one of the unspoken questions that has inspired great thinkers through the ages. The cultural theorist Stuart Hall is one such figure who sought to understand the roles we adopt or resist, how we interact with each other in our personal, social, and professional lives and what historical or contextual influences play a part. Hall was influential in early campaigns for social and racial justice and a central figure in the founding of Iniva. These preoccupations also contributed to the work of Wilfred Bion who developed group analysis in the UK out of his work with WW2 veterans suffering from what came to be known as post-traumatic stress disorder. Bion recognised the ways in which unconscious dynamics mould relations in groups and also between them. As both psychodynamic theory and our own experience illustrates, we all have a primal need to belong; the easiest route to achieving this is to create ‘in’ and ‘out’ groups, a process which relies on splitting off unwanted or hateful parts of the self and projecting them into others, an unconscious and often extremely subtle phenomenon that is at the root of much childhood pain as well as cultural tensions. Bion and Hall remain seminal figures in their own ways whose ideas continue to inform our understanding of how we make sense of our worlds both within and without. Each was interested not just in how we engage in social groups but, importantly, how we describe our current and historical experiences to ourselves and to each other. We know that memories themselves are not factual records of the recent or distant past but are narratives forged out the residue of emotionally potent experiences, some too disturbing or painful to leave unedited or even to hold in mind. Memories, the meanings we make of them and the stories we tell each other are the threads that bind individuals, families and nations. We need to be conscious of, and attentive to, the ‘fabric’ we create. ‘How do we live well with others?’ is now on sale in via Iniva Creative Learning. Join us for the launch event at Iniva on Thursday 3 April, 5-8pm. See more information here and book via Eventbrite.